I should let my daughter pick our numbers more often. She is stoked when the strangers we met on the catamaran the day before bought her a Dora towel and some kites as a thank you present for picking the winning number. Her day could not have been brighter. We had met 4 lovely chicks on our SEAduced snorkeling tour, which not only invited me out that night for some drinks, but also invited us the next day to the famous chicken drop with them. We got there quite late and the line was out the door for tickets for entering the chicken drop contest. By the time I reached front of the line there was only tickets for the drops after 9pm and we didn’t think the kids would last that long so we ended up with no bets, but we were happy to just sit back and watch this strange sensation. There is a large square chess-style board in the sand with 100 numbers on it. 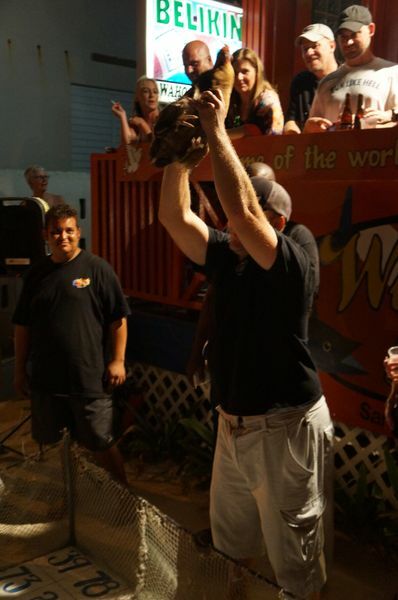 A lucky person gets to "throw" the chicken. But first the ritual. Rotate the chicken in a circle. Blow in the chicken’s bottom for good luck. Release the chicken on to the board. 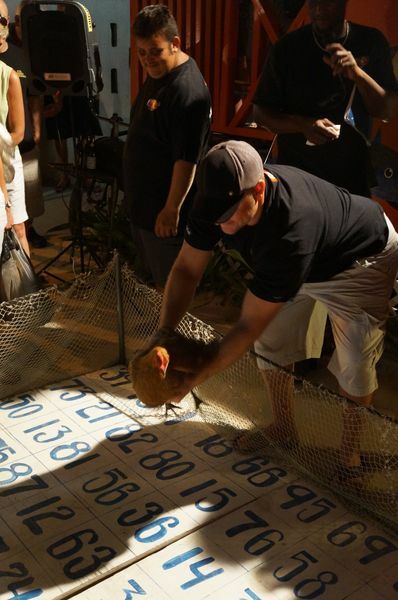 Once the chicken is on the board the crowd is yelling and screaming its encouragement to poop. That’s right you heard me a bunch of grown adults, slightly or strongly inebriated are yelling at a chicken to take a dump. 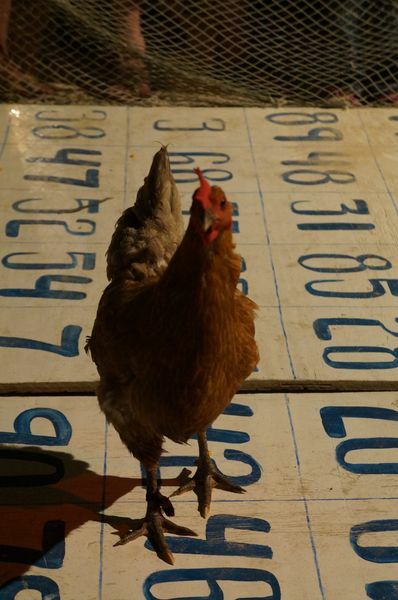 Whatever number the chicken poos on, wins. If it’s on two numbers the winning is split. And as a consolation, the winner must clean the turd before claiming their prize. The whole thing is outrageously addictive and I found watching the crowd highly amusing. The poor spooked chicken not so much. In between chicken drops my kids took to the board for dancing and amusing the crowd. During one long break the rooster escaped and the wait was filled with suspense as the chicken hunt went down. Meanwhile our new friends were celebrating. They had successfully brokered a deal and were returning to Belize to open a new bed & breakfast. 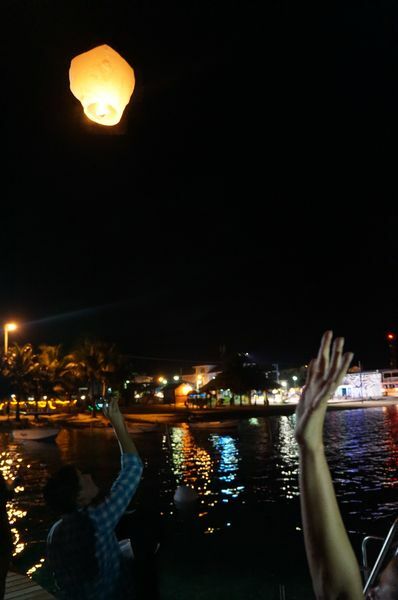 We went out to the boat dock to light some lanterns. 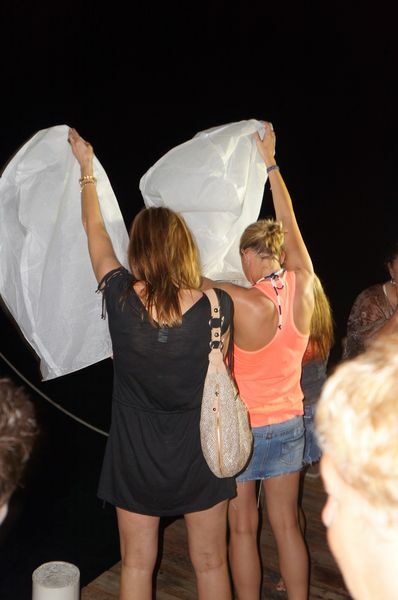 What was meant to be a romantic symbol and trial for future weddings in Ambergris Caye but it turned into the highlight off my night, yes above the chickens, as one lantern was released a little too early and made it’s way to the deck of a nearby yacht. 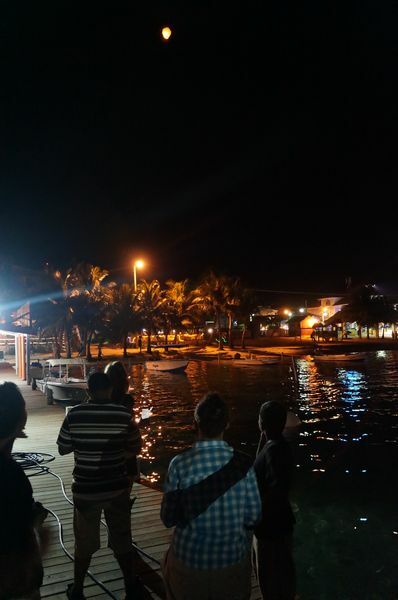 The group we had with us erupted in complete madness as two members dashed to the boat to prevent the burning down of such a fine (and expensive) craft. 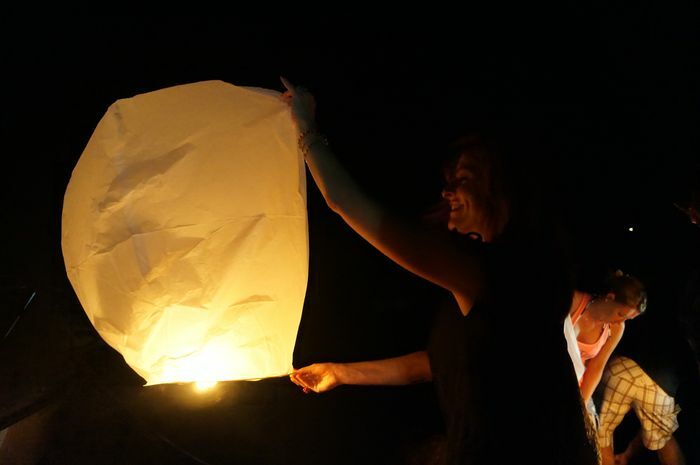 Luckily there was no damage and out of the 4 lanterns, 2 successfully made it into the air and flew away on the thermals. Not quite the same grandeur as our Chiang Mai lantern festival, but bringing back memories all the same. We didn’t stay for the big draw. It was late and the kids had not eaten so we headed home. It was later that night I got my Facebook message reporting the big win of our new friends. It was so awesome and the next day we were ready for more celebrations, spending the day with them in a hot tub ordering food and drinks mostly generously donated by the chicken turd winners. Three days we spent with those gorgeous girls from the catamaran. It’s not very often you click with single people who are happy to spend their vacation with an Aussie family with young kids. On top of that I managed to fit in quite a number of girls nights out and it filled my little social quota to the brim. Since then our American friends have invited us to visit them in New Orleans. None of them live there mind you, but they all love it and so in May this year we have orgnaised for a reunion of sorts in New Orleans. I cannot wait to see them again, those ladies who so generously donated their time to some Aussie strays, but hopefully this time there is no chicken turd cleanup or near-miss impromptu yacht bonfires. Want to see how it really works? Check out the video below!